2018 is just around the corner. Towards achieving University College status by 2018, KYP is striving to create more linkages with the industries. On 12th December 2017, Kolej Yayasan Pahang received a new partner from the industries, Institute Malaysia Plantation and Commodities (IMPAC). A Memorandum of Understanding (MoU) Document Exchange session between Kolej Yayasan Pahang (KYP) and Institute Malaysia Plantation and Commodities (IMPAC) was held at The Everly Hotel, Putrajaya. 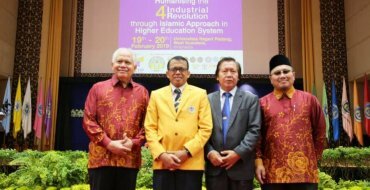 KYP was represented by YH Prof. Dato’ Dr. Abdul Monir Yaakob, Board of Director, while IMPAC was represented by YBhg Dr. Zairossani Mohd Nor, Chief Director of Malaysian Rubber Board. It was witnessed by YB Datuk Seri Mah Siew Keong, Minister of Plantation Industries and Commodities. The objectives of the MoU with IMPAC are to collaborate, exchange, and share information in terms of knowledge, skills, research, paper publication, community service, student activities and other aspects that could benefit both parties. “IMPAC mission is to produce more expertise through training based on academic and skills to fulfill the needs of commodities industries. Thus, the MoU document exchange session today between IMPAC and six (6) agencies shows that we are serious in improving the commodities industries,” said YH Datuk Dr. Ahmad Kushairi Din, IMPAC Chairman in his speech. “The main focus of IMPAC is to create more courses that can generate to the commodities sector. IMPAC will be a leading body as well as the main training provider to produce more expertise that will help to develop the commodities industries,” said YB Datuk Seri Mah Siew Keong, Minister of Plantation Industries and Commodities before launching the IMPAC website.